Spring cleaning allows you to take charge of the messes in your life and encourage a clean and healthier you by decluttering. Since your last checkup and cleaning, your mouth has accumulated a different kind of clutter from the one you’ve been cleaning around the house, plaque and tartar. Take control of your oral health by scheduling your next dental checkup in Aurora and clearing out all your old dental products from under your bathroom sink. Here’s why you should give your oral health a spring cleaning. Why are Checkups and Cleanings so Important? 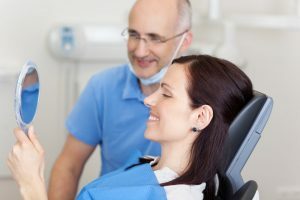 Instead of waiting until a problem surfaces to go see your dentist in Aurora, save time and money by attending your 6-month checkup and cleaning. By doing this, you can reduce your risk of needing invasive treatments like root canals, or you can catch symptoms of gum disease before they progress. Brushing and flossing aren’t always going to be enough to keep dental problems away. Your dentist will use special tools to help clear plaque and tartar that your daily routine can’t. With little to no cost to you if you have insurance, attending your checkup and cleaning is easy and effective, leaving you no reason to not go. Toothpaste—only use your old toothpaste if it’s within two years of the manufacture date. After this, the mint-flavor and fluoride fade and become less effective. It loses its ability to fight plaque and tartar and freshen your breath. Toothbrush—if you found a mountain of unopened toothbrushes, you can definitely use them. When they’re opened, it’s best to replace them after about 3 months to ensure that the bristles can still scrub away tartar and plaque as well as for sanitary reasons. You wouldn’t want to use a toothbrush that’s been sitting in a cup collecting dust, so be sure to throw out old brushes that have already been opened. Mouthwash—is good to use within 2 years of its manufacture date. Your mouthwash most likely contains antibacterial ingredients like alcohol or antiseptic, along with water. After the 2 years though, these active ingredients start to dissolve, leaving just water. This makes the rinse significantly less effective. Your dentist will be able to point you towards specific products that could benefit your oral health, so be sure to ask at your next cleaning and checkup. This spring, give yourself one less thing to stress about by keeping up with your oral health! Drs. Matt Mauck and Andrew Ricci offer their patients comprehensive care by being able to provide them with everything from regular checkups and cleanings to full smile makeovers. Their goal is to leave you feeling refreshed and healthy and ready to tackle the rest of your day. To schedule a checkup and cleaning, or for any questions, visit their website or contact them at 303-974-4442.